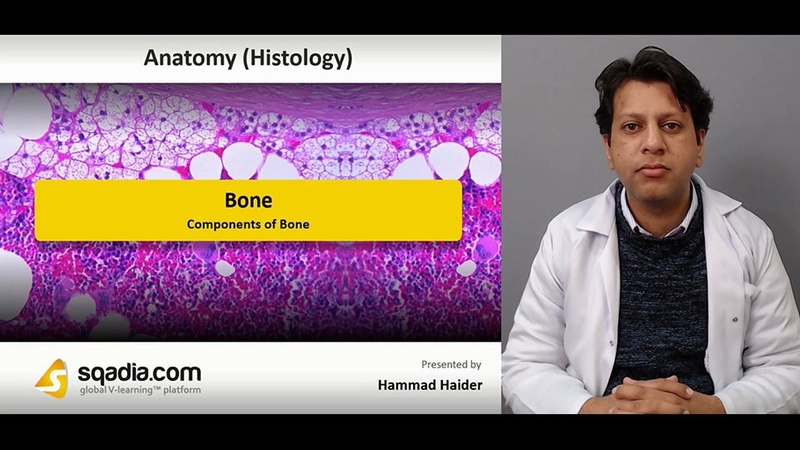 In this lecture ´´Bone´´ is explained. Section one is about ‘‘Components of Bone’’. At first information about bone tissue is given. After that, bone matrix is discussed in detail. Educator tells that bone is a specialized connective tissue composed of calcified extracellular material called the bone matrix. Furthermore, light is shed on mineralization of bone matrix. Lastly, periosteum and endosteum are pursued. Section two is about ''Bone Cells''. In the beginning, osteoblasts are pursued along with the elucidation of its medical application. Then osteoclasts are discussed. Educator also tells that osteoclast development requires two polypeptides. Medical application of osteoclasts is also covered in this part. Section three is about ''Types of Bone''. Earlier in this section, lamellar bone is elaborated. After that information about osteon is delivered. Then Volkmann Canals are highlighted. Following this compact bone is discussed. Furthermore, woven bone comes under consideration. Later on, light is shed on type of bones. Lastly, information about diagnostic importance of antibiotic tetracycline is given. Section four is about ''Osteogenesis and Remodelling''. Firstly, osteogenesis is discussed in this section. Educator talks about intramembranous ossification. Following this, endochondral ossification is pursued. Likewise, illustration of cells of primary ossification center is given. Afterwards, epiphyseal cartilage is elaborated. At last, bone remodelling and repair is focused. Section five is about ''Metabolic Role''. Educator begins by explaining metabolic role of bone. After that mechanism for raising blood calcium levels is discussed. This mechanisms regulated mainly by paracrine interactions among bone cells. Furthermore, syndesmoses and symphyses are elaborated. Educator tells that syndesmoses Join bones by dense connective tissue only. Likewise, symphyses Have a thick pad of fibrocartilage between the thin articular cartilage.